The Aboriginal Birth Cohort Study (ABC) is recognised as the largest and longest running Indigenous birth cohort in Australia. As part of the Life Course Program at Menzies, the main aim of the study is to assess the effect of early life factors, birth and childhood, on later physical and mental health, and to examine which factors influence these across the life course. This study seeks to identify those who are most at risk of developing chronic conditions, such as diabetes, heart and kidney disease and mental health problems. 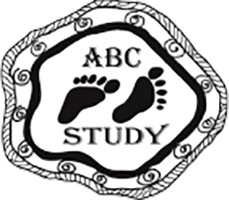 The ABC study was founded by Dr Susan Sayers who initially aimed to study outcomes of fetal growth restriction (FGR) within the womb on subsequent growth and development of chronic diseases in adulthood. Although the ABC cohort was recruited from Royal Darwin Hospital they now reside in over 40 urban and remote communities across the Top End. Researchers travel to these communities to conduct regular comprehensive health checks across the life course.